What is CC Grant Tracker? 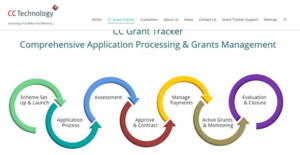 CC Grant Tracker is an easily adaptable online grant management system designed by CC Technology Ltd to manage the entire grant lifecycle for local communities, development aids, education, Research funders, NGOs, public bodies, and foundations in Europe, Asia, and North America. It’s a comprehensive application processing and grant management solution that provides a fully integrated blend of functionality and features. The platform manages every facet of grant management right from the initial application through reviewing, approval, decision making, scoring, and reporting. CC Grant Tracker is an advanced and effective program that enables organizations of different sizes to manage grant-making activities to gain significant efficiencies and benefits. It delivers performance and management information at a program, project, and portfolio level to improve business insights and expedite decision making. CC Grant Tracker is an all-inclusive system that provides all the features required to successfully manage the end-to-end grant lifecycle. The platform underpins every facet of grant management, thanks to a comprehensively configured setup that supports application submission, assessment & review, contract & financial management, monitoring, business intelligence, and evaluation. This makes it an ideal solution for private, public, and charitable organizations looking to manage numerous grant programmes with potentially multiple sources of funding. In addition, CC Grant Tracker is easy to use. The program provides an interactive portal for applicants and reviewers with numerous user-friendly features. The online applications deliver an intuitive form-filling experience and powerful validation tools to improve the quality of data. Better still, there is a flexible form designed that enables administrators to create new forms and grant program with ease. The powerful multi-stage assessment and review module makes it easy for organizations to evaluate and make decisions for each application. It streamlines the approval process and consequently simplifies the management and administration of grants. When decisions are made, administrators can leverage the predefined templates to craft and send acceptance or rejection notifications to applicants. If you are considering CC Grant Tracker it may also be beneficial to examine other subcategories of Best Grant Management Software listed in our database of B2B software reviews. Since each company has unique business needs, it is sensible for them to abstain from searching for a one-size-fits-all perfect software system. Needless to say, it would be useless to try to find such an app even among market-leading software applications. The smart thing to do would be to catalog the various vital elements that require consideration such as required features, finances, skill levels of workers, company size etc. Then, you should do your groundwork thoroughly. Read some CC Grant Tracker reviews and look into each of the other systems in your shortlist in detail. Such in-depth research can make sure you discard ill-fitting platforms and zero in on the system that offers all the aspects you require for business success. How Much Does CC Grant Tracker Cost? CC Grant Tracker doesn’t reveal its enterprise pricing to the public. Contact the vendor for detailed pricing information. We realize that when you make a decision to buy Grant Management Software it’s important not only to see how experts evaluate it in their reviews, but also to find out if the real people and companies that buy it are actually satisfied with the product. That’s why we’ve created our behavior-based Customer Satisfaction Algorithm™ that gathers customer reviews, comments and CC Grant Tracker reviews across a wide range of social media sites. The data is then presented in an easy to digest form showing how many people had positive and negative experience with CC Grant Tracker. With that information at hand you should be equipped to make an informed buying decision that you won’t regret. What are CC Grant Tracker pricing details? What integrations are available for CC Grant Tracker?